I’m in the middle of my preparation for CODEX 2019. I use CODEX as my every two year deadline to introduce new work. I’ve got a suite of work in progress and, just this week, I’ve started working on a new piece. I know our processes all vary, and learning about them can be interesting, so I thought I’d share mine. Most of my ideas are sparked by something I hear on the news, talk about with Greg, or run across in daily life. This particular artists’ book began as a response to the jacket Melania wore to the detention center in Texas. Then last weekend I drove to Hanford, CA to visit my parents. Usually Greg drives but in this case we wanted to get there early (Greg is not a morning person) so I drove and he slept. I didn’t turn on a podcast or the radio because I wanted him to sleep as much as possible. I really should sit/drive/walk with quiet more often. Sometimes I forget how much fun my brain has meandering and making connections. It started with problem solving another in progress piece and making some mental “to do” lists. Then my brain wandered over to the jacket idea. Andrew Lloyd Weber’s musical Joseph and the Amazing Technicolor Dreamcoat floated by. As did Madeleine Albright’s book about how she used pins to signal different things in her diplomatic meetings. Aha! Now I knew what I wanted to do for this artists’ book. The cover would be the green fabric of the now infamous jacket with the title in the same font style as the writing. The working title: Melania and the Controversial Pale Green Pea Coat. My goal with this book is not to espouse a particular political viewpoint. Rather to explore how women use fashion to communicate in politics and diplomacy. With some added lyricism, Andrew Lloyd Weber style. Clearly still a work in progress, but I have some threads to pull. I found some interesting references to men’s fashion being used the same way, in particular Mr. Trudeau’s socks. Perhaps there is a sock book in my future. But I digress. Stay tuned for the next phases: reading, materials collection, and writing. How does your artwork begin? With an idea? A material? 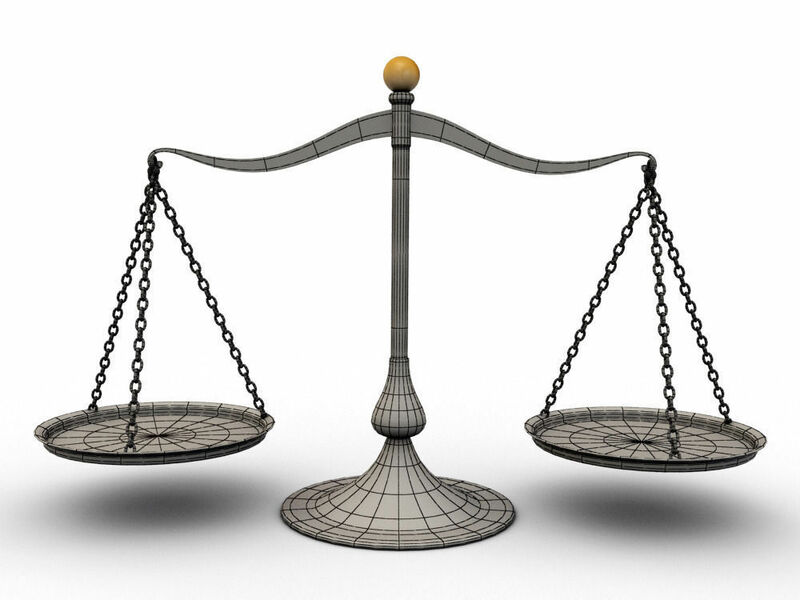 Do you have a standard process? Please leave your process in the comments! Among my favorite tools is this wonderful folding rib that was designed by Christine Cox of Volcano Arts. If I had to choose only one bone folder to have in my studio, this would be it. I prefer options and actually have several different tools in this category, but if going to a desert island with limited luggage, this would be the one. I can use it like a regular bone folder to score a page and sharpen a crease. It works well with the scoring board I like to use. It’s shape fits comfortably in my hand. It has the benefits of a Teflon bone folder. It smooths larger areas at a time and more easily. I especially love it for covering Davey board with paper or fabric for book covers. 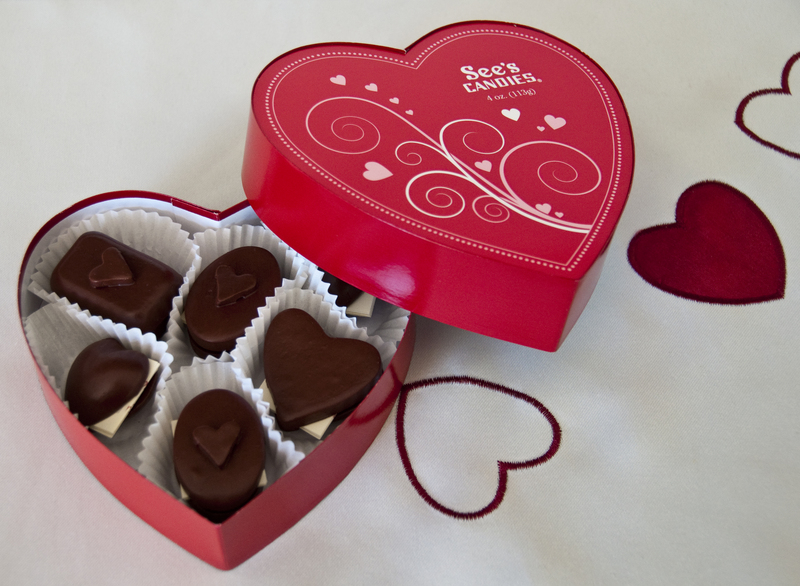 It’s a dream to use for box making. The curved end gets in tight spaces and allows detail work. The square end is great for getting into inside box corners. It is shorter than a traditional bone folder so it fits better in my pockets. Tempted to try it? 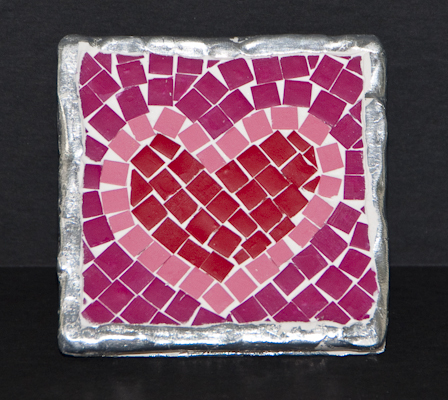 You can buy it directly from Christine Cox at Volcano Arts, or if you’re ordering from Talas already, you can buy it from them. 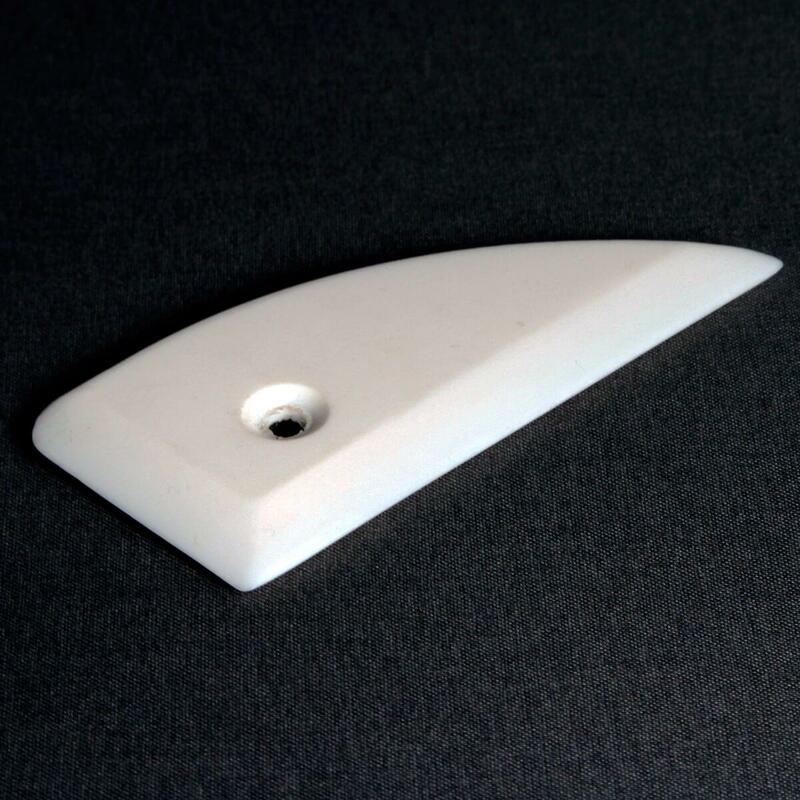 Do you have a favorite shape or material bone folder? I’d love to hear about it in the comments! Hello again. It’s been a long time. I have been blogging in fits and starts and, for almost a year, not at all. I think about it all the time. I’ve got dozens of blog posts written in my head. But none of them made it to the computer or your inbox. One of my biggest challenges, and I suspect yours as well, is being able to say, “No.” I enjoy helping people and making people happy and I am quite good at over committing myself out of the best intentions. Unfortunately I often fall short and feel sad/frustrated/guilty for not living up to my own expectations or promises. After more than a year of falling short in too many places, I’m in the process of re-balancing my time as an artist and teacher (and wife, daughter, sister…). One of my priorities is to get back to regular blog writing. I’ll share more about that soon. And more about my work. And tools I can’t live without. And events of note. Looking forward to chatting with you soon. Since Sunday was National Day of the Cat it seems appropriate that we bookend the day with two cat related blog posts. Last week, Meet the Cats, this week Cat-A-Log. Several years ago I began a project titled Picturing Dialogue which was a weekly call and response exchange between me and several other photographers, one-on-one. During that project one of the participants, Karen Koshgarian, and I discovered that we enjoyed our weekly email chats and one another’s perspective on the world and we’ve continued with annual weekly photo exchange projects ever since. This year we’re doing two projects, “Signs of the Times” and “Watch Your Step.” Having a weekly exchange and an art partner is a great way to keep art-making constant and fresh. If you haven’t tried this kind of art exchange, I highly recommend it. If you’re looking for ideas, you might check out The Photographer’s Playbook: 307 Assignments and Ideas. Although we don’t get our ideas from that book, I do have it in my studio and think it’s a great resource to get you started! In 2015 one of our projects was titled “Cat-A-Log.” We took turns sending photos of our cats back and forth. Karen’s cat Little Rickey is black with white markings, our kitty, Ellis is white with black markings. It was a fun way to share our love of cats and a much needed break from the more serious political work that I usually do. This is one of the artists books I’m working on in the studio. It will, of course, have one white and one black cover. Here is a sneak peek of the beginning of the exchange. All photos are copyrighted by the photographers and may not be copied or reproduced without explicit written permission. Have you done a project about your animals? Have you done a project with another artist? Feel free to link to your project in the comments section. 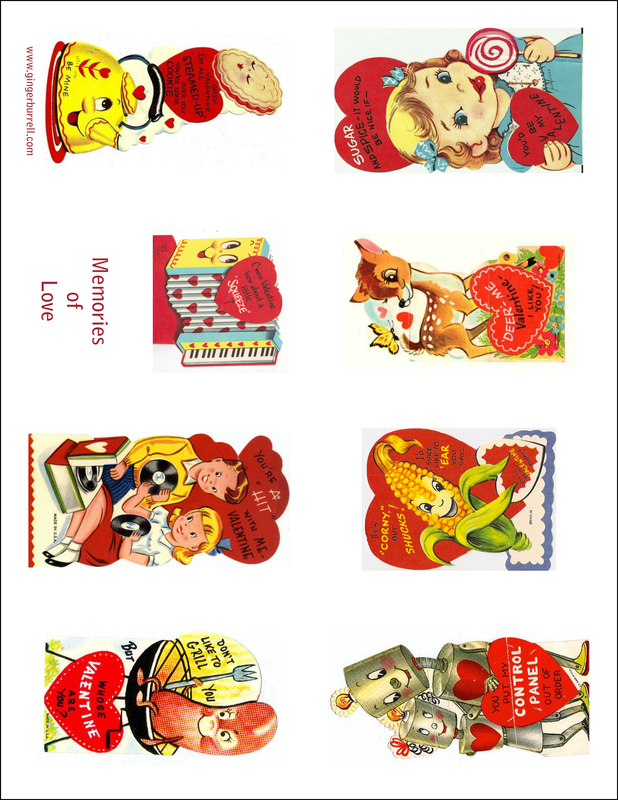 This year I’ve made a flutter book for you using images of the valentines I remember from my childhood. 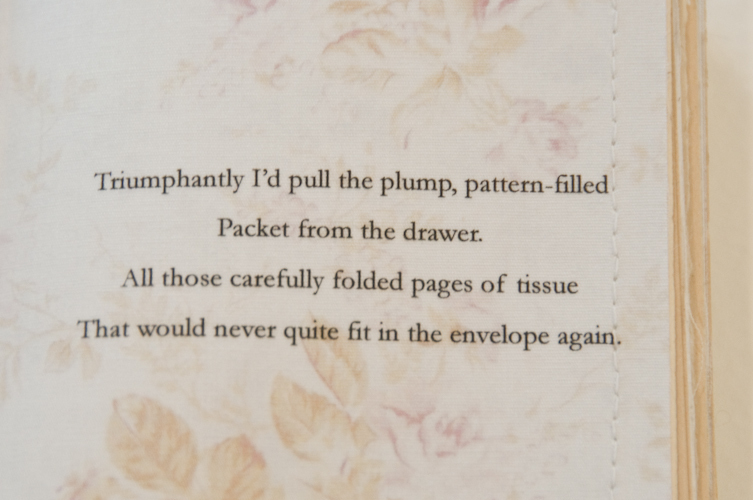 Remember those pretty paper valentines with the silly sayings and thin white envelopes? 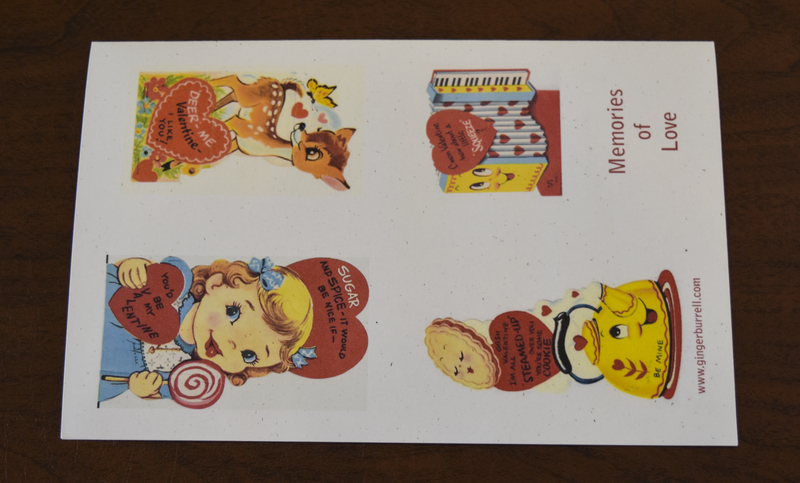 One of my earliest memories is being home sick from school, laying on our teal floral couch (it was the 70’s) and carefully signing my valentines in my best penmanship. 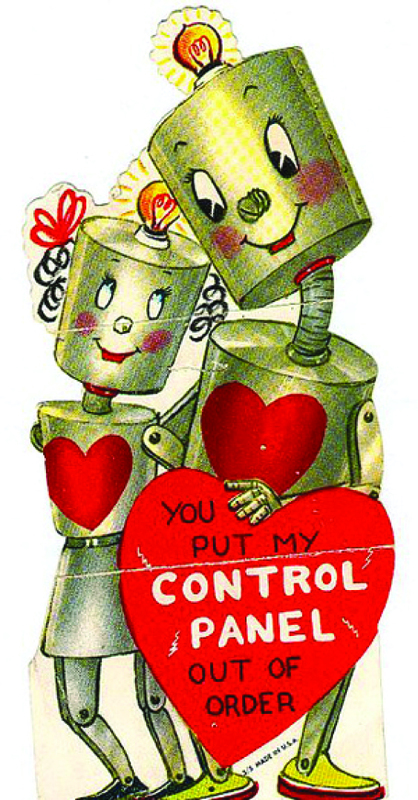 Whether as a gift for a friend, an addition to your collection, or as a way to share with your children the valentines of your youth, I hope you enjoy. Feel free to print and share as many as you’d like. This is a big file, so be patient. Click on the title below to download. Print on nice paper. For the demo book, to avoid the stark white, I printed mine on Wausau Royal Fiber in Birch. Be careful when you print. If your print dialogue defaults to “fit to page” it won’t work quite right. 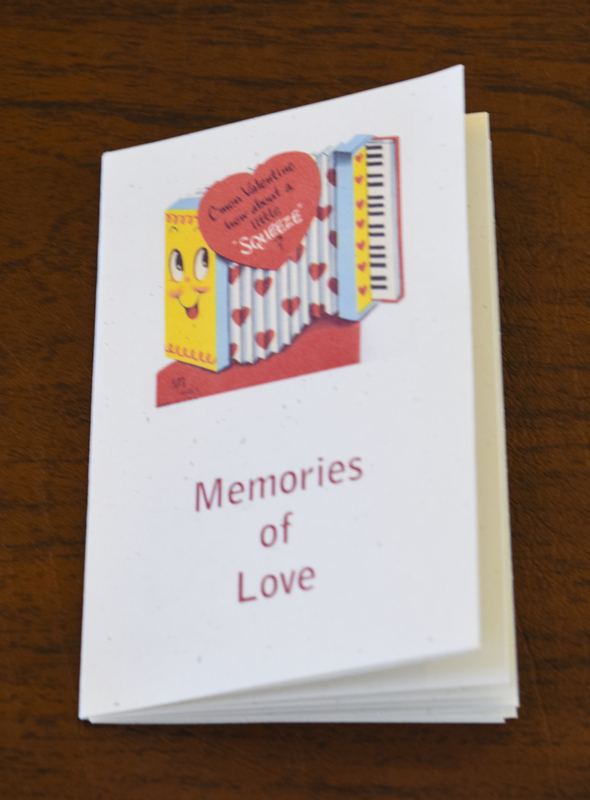 The book is designed to have the valentines centered on each page. After printing your page, fold the paper in half with the images on the outside and use a bone folder to make your crease sharp. With your paper still folded, fold each end into the middle fold. Remember to crease every fold. Unfold. Now fold your paper in half lengthwise. Crease with your bonefolder, then unfold. Re-fold your paper in half the first direction with the images on the outside. 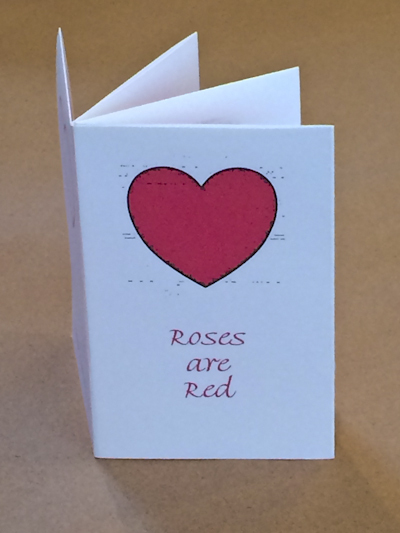 Cut with scissors, very carefully, from the top of the fold, down to the horizontal fold. Keeping your book folded, use the outer two folded halves to push inward. The cut halves will fold the other way so you have an X. Lay flat and press starting with the back page (the iron valentine). Voila! Wishing you and your loved ones a nice holiday. Questions? Please feel free to email. 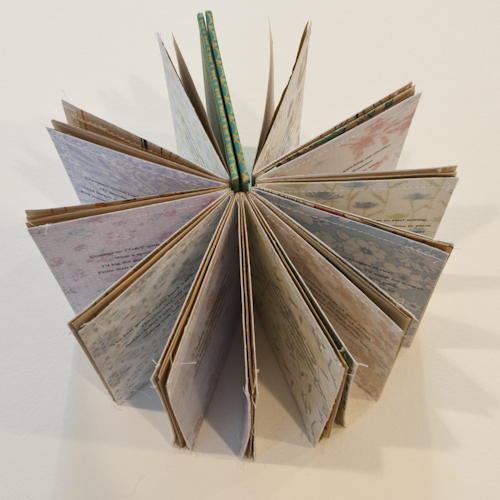 I participate in the Marin MOCA show each year with the idea that altered books can and should have the same standard of quality, content and detail as any artist book. I entered the first year thinking that making an altered book was so different from how I usually worked that it would be a good stretch for me as an artist. To my surprise, over time, my experience in making books for Marin MOCA has influenced my regular art practice resulting in such titles as Reliquary, Dear IRS and Breathe for Those Cannot. 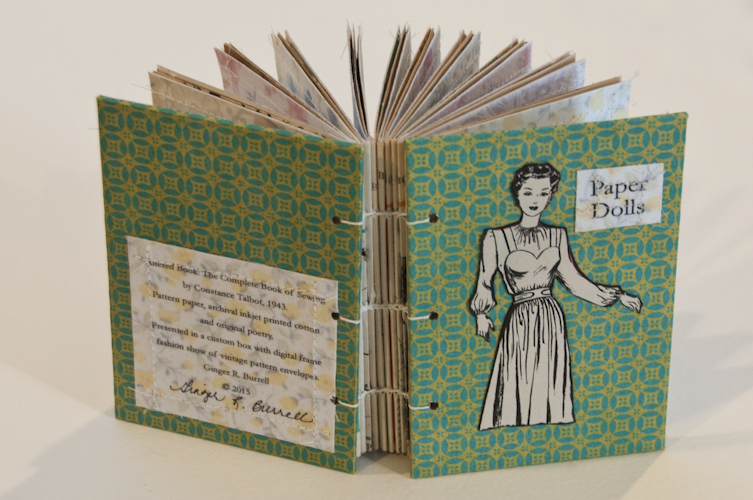 This year’s altered/artist book entry, Paper Dolls, began as a feminist manifesto about the role of women in society past and the ever-present attempts to return women to that role. In the entire book, The Complete Book of Sewing by Constance Talbot (1943), there was only one photograph of a man sewing and he was listed as THE expert. Over time, however, Paper Dolls became a sentimental journey through my childhood. 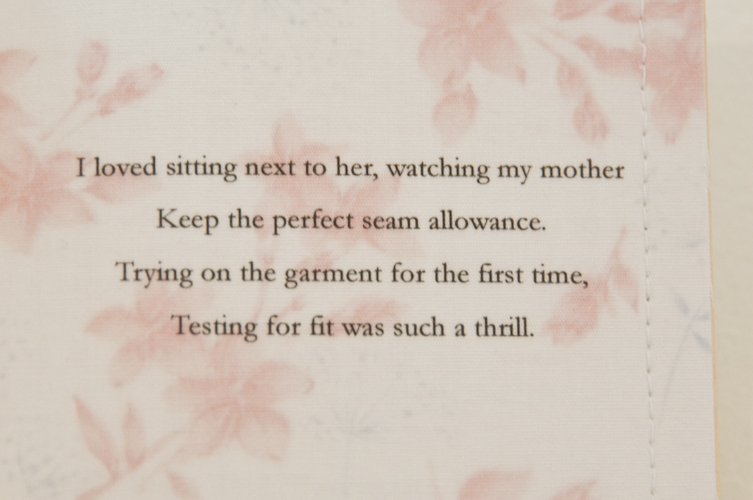 As I wrote the poetry, I realized that so much of how I make art now was influenced by the time I spent then with my mother imagining, designing, and creating clothing. Every trip to the fabric store was a lesson in color theory, textures, and attention to detail. Sensory memories of whispery pattern paper, the whirring sewing machine and being pricked with pins, still in the garment, began to rearrange my ideas. 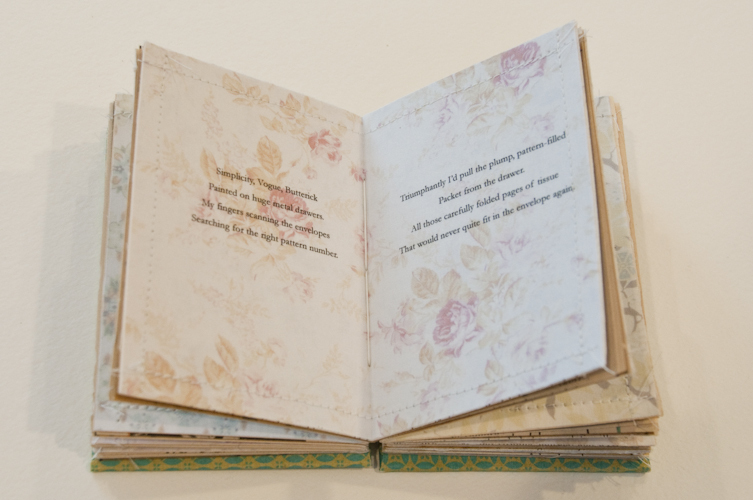 The finished book is multi-layered with poetry printed on cotton patterned fabric, pages made of layered pattern paper, and pages of the original book. 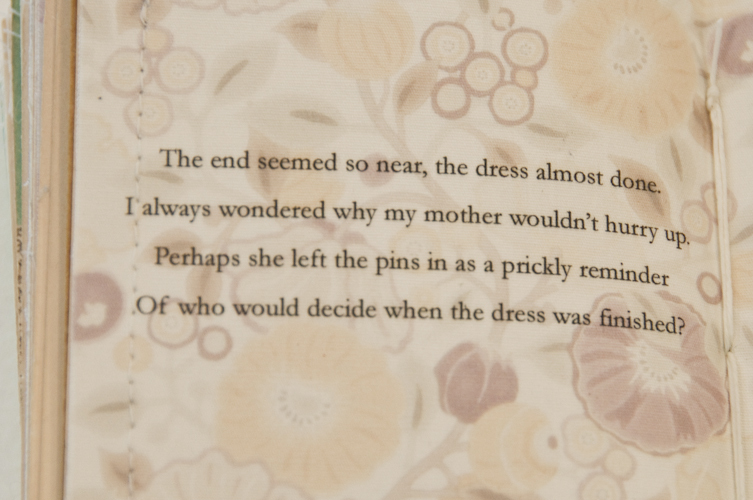 The altered/artist book is sewn both by hand, with Coptic binding, and also by machine, through the cotton and paper pages. I am fascinated with technology and enjoy incorporating the digital with the traditional book form in a way that serves the book’s content. 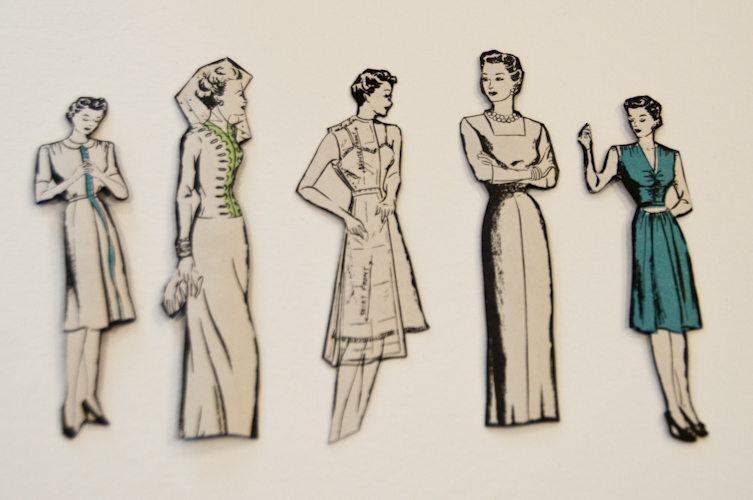 In the one copy for Marin MOCA, Paper Dolls features a digital frame which plays a fashion show of pattern packets with women’s clothing from 1900 to the 1970s. This theme is further expressed with inclusion of cut-out paper dolls presented in the “sewing” box with the finished book. PS. Mom, I love you!